1:36 pm- PDT Switzer R1KX. 11:25 am - PDT - Tym again in the black car - 9.61@151mph. 11:11 am - PDT - Typical Ohio style "sport compact car". Dialed in with a blistering 17.85, we know it has much more in it. In the Cavailer vs Evo battle, I am not sure which to pick. Speed mod to the front fender. 11:00 am - PDT - Black R35 . 9.7@151mph. Tym driving. 10:47 am - PDT . Last run in the 2012 was an 11.35. DA is 2900 ft. Bad air. Here is a picture of the 18" CCM wheels, over the top of the 400 mm STILLEN CCM brakes. Neil mentioned there were some mods to make the calipers fit. 9:25 am-PDT - The report is that it is hot and humid in Ohio. Quickest pass of the day so far is the STM Evo with a 9.5@160 mph pass. Also mentioned is a lot of mid to low 10 second Evos, with a couple in the 9's. Live Blogging, or as close as I can get to live blogging, me being in LA, and everyone being in Ohio. 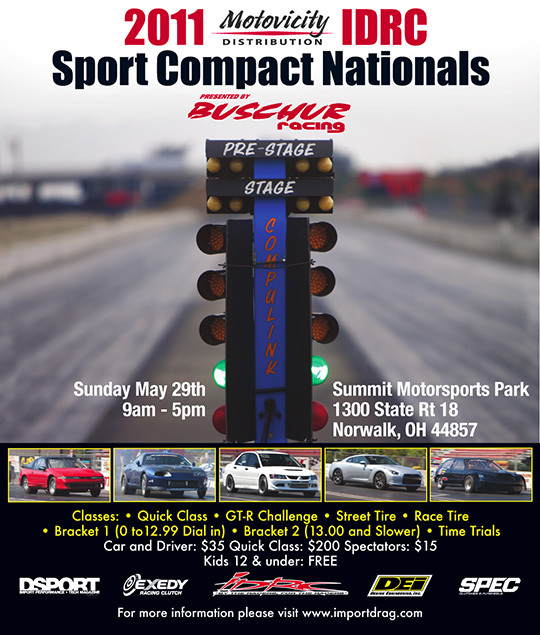 Switzer Performance has several Nissan GT-Rs out at the IDRC Sport Compact Nationals in Norwalk, Ohio. There should be a P800,R900, R1K, and a 2012 GT-R.
First pass in the 2012 netted a 11.32 with a 1.7 60 foot.